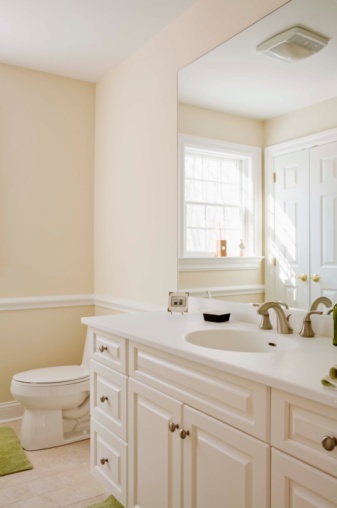 Mechanical bathroom vents are required by the building codes in most municipalities. Mechanical ventilation is any method of using a power-driven fan to move air in a desired direction. These types of systems are commonly installed in bathrooms, on or near the ceilings, to remove moist air when showering or bathing. Mechanical ventilation systems are also installed above stovetops to remove water vapor, cooking smells and to exhaust the by-products of combustion for gas stoves. They are also installed in attics to increase the amount of air exchange with the outside, reducing moisture buildup and mitigating the chances of mold. Ventilation reduces the amount of moisture in the interior of a home. This moisture comes from people breathing, bathing and sweating, as well as from plants, cooking and stored firewood. As the moisture content of the air rises, the likelihood of mold and fungus taking hold increases as well. If the moisture content of a wooden structure exceeds 18 percent it can begin to deteriorate through rot. Your home needs a much dryer environment than you do, so trying to find the correct humidity is always a balance. Ventilating the house also brings fresher, cleaner air into the living environment. Common household cleaners and products evaporate and can create indoor air pollution. The more you ventilate a home the more its heating and cooling efficiency is reduced. When you bring in the exterior air you increase the workload for your HVAC system. However, you can install heat recovery ventilators (HRV) to recover the energy lost through ventilation. Another disadvantage of mechanical ventilators is that they can depressurize a home. The modern home is so airtight that when you force air to the exterior it can lower the interior pressure. This can cause problems for natural vent appliances like furnaces and hot water heaters that need positive pressure to exhaust their combustion products out of the home. The negative pressure pulls these gasses into the living environment and are potentially very dangerous for the occupants.